The United States has long been unusual for the absence of socialist, or even social democratic, politics. There is debate as to why this is but, whatever the reasons, the US never developed a mass class-based social democratic party capable of seriously reforming capitalism. Then the 2016 Democratic primary happened, putting self-proclaimed socialist senator Bernie Sanders on the national stage. While his policies were those of middle-of-the-road social democracy (and he explicitly rejected any attempt to change property relations), millions of Americans showed themselves open to policies well to the left of acceptable discourse and that being a socialist did not make you unelectable. Even though Sanders ultimately lost the primary, in the wake of his candidacy we are seeing an embryonic socialist movement emerge in the United States. Given the “special relationship” between the two countries, it is worthwhile for the British left to know what their American counterparts are doing and which institutions to watch. Formed out of Bernie Sanders’ campaign machine, Our Revolution fights to shift the Democratic Party towards a more social democratic position. It does this by backing candidates in primaries and mobilising around progressive causes. Given its origin, it has obvious parallels with Momentum. However, Our Revolution is not even remotely democratic, with a self-selecting board of directors and no mechanism for membership democracy. Attempts to reform the Democrats will likely prove difficult given that American political parties are not membership organisations, but rather loose coalitions of elected officials. There is effectively no standing party policy and elected representatives would not be required to vote for it if there were. The membership has no control over the party machine, which is in the hands of politicians. Given all of this, the prospects for Our Revolution to bring about progressive change look limited. 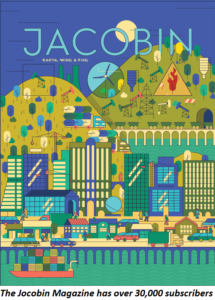 Founded in 2010, Jacobin is a self-proclaimed “leading voice of the American left”. With over 30,000 subscribers and an even larger online readership, this is likely true. 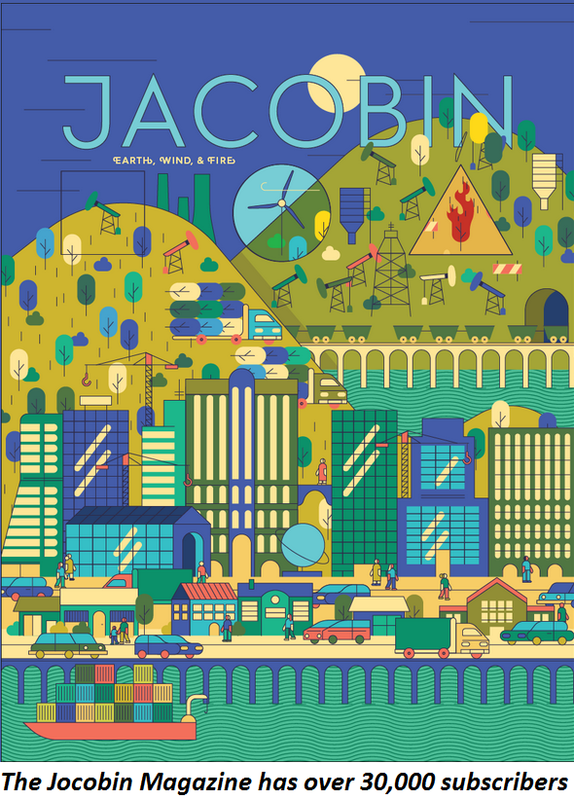 Jacobin publishes four thematic issues each year, in addition to continuous online coverage of current events, the history of the left, and socialist theory. Wry and at times contrarian, it has proven particularly successful at reaching out to those who would consider themselves broadly “progressive” but not necessarily socialists, introducing them to Marxian analysis. The editorial team are associated with the Democratic Socialists of America (see below). They advocate for immediate reforms to capitalism while arguing that these reforms will require more structural changes to the economy and ownership if they are to be maintained. While doing fairly well even before Sanders came onto the national stage, Jacobin massively benefited from the resulting interest in socialism. Their continued growth has allowed them to publish a series of books (in partnership with Verso), curate a selection of podcasts referred to as Jacobin Radio, and launch the more theoretically inclined journal Catalyst. They have also produced the pamphlet The ABCs of Socialism, a series of essays addressing common misconceptions about socialism in an accessible manner. Despite its bizarre name, frequent vulgarity, and occasional surreal tangents, the Chapo Trap House podcast offers surprisingly insightful and intelligent commentary on American politics. Started in the midst of the Sanders’ campaign, it gathered a cult following for its scathing critiques of Clintonite liberalism and “horse race” punditry. It is meant to entertain as much as inform and spends a lot of time mocking current events and whatever has been trending on Twitter. However, Chapo has also featured a number of in-depth interviews covering issues as varied as fixing American healthcare, Middle Eastern geopolitics, and the uses and abuses of identity politics. The hosts are members of the Democratic Socialists of America (see below). There are two shows per week, one of which requires a $5/month subscription to access. Here, they discuss Richard Spencer and the “alt-right” with Angela Nagle, author of Kill all Normies: Online culture wars from 4chan and Tumblr to Trump and the alt-right. Like all countries, the US has its assortment of far-left sects, most of which are neither sufficiently interesting or relevant to discuss here. However, Socialist Alternative (which has links with the Socialist Party in the UK) is notable for member Kshama Sawant successfully being elected to Seattle city council as a socialist in 2013 and again in 2015. Key to their success has been a constructive engagement with social movements such as Occupy. Thanks to Sawant’s organising and presence on the council, Seattle has passed a $15 minimum wage and a municipal income tax on high earners to make local taxation more progressive (however, the latter is being challenged in court). She has also been active on issues of transport and housing. Socialist Alternative member Ginger Jentzen is now hoping to replicate Sawant’s success in Minneapolis. Despite these positive stories, it is unclear that Socialist Alternative can ever become a true mass party given its rather orthodox Trotskyist inclination. Emerging from the breakup of the once-venerable Socialist Party of America, the Democratic Socialists of America (DSA) were founded in 1982 as a broad-tent party. They were often unclear about their exact ideology, with some members seeming to advocate only social democracy, although others were considerably to the left of that. For the most part it has not historically run candidates in elections, instead campaigning on specific issues and hoping to shift the Democratic Party to the left. The resurgence of interest in socialism brought about by the Sanders campaign has caused it to grow from less than 10 000 members to over 28 000 in the past year. Its most recent convention was effectively a refoundation of the party, moving it significantly leftward. Decisions included leaving the moribund Socialist International, allowing the formation of internal factions to enhance debate, and agreeing to focus more resources on the labour movement. The organisation also appears to be shifting away from the Democratic Party and towards running independent candidates although, due to laws making it difficult for candidates of small parties to be listed on ballots, they may sometimes nominally run as Democrats. They have sought to build international links, inviting representatives of La France Insoumise, Podemos (Spain), Bloco de Esquerda (Portugal), Partido Socialismo e Liberdade (Brazil), and Momentum to their convention. It is now the largest membership-based socialist organisation in the US since the 1940s and has over 160 local chapters across the country. Despite imperfections and occasional ideological vagueness, it has become the gathering place of the broad American left and could one day form the basis of a mass socialist party. Editorial note, 1st October. Some links which were missing as originally published have been restored. Posted in: International, Politics, US & Canada. The forces are certainly there – masses of working people, Sanders supporters, trade unions, Black Lives Matters, poor whites, LGBT Groups, Disabled Groups, Women’s Groups, Hispanic Groups etc. Sanders flower was as I expected crushed by the Democrat Party establishment. It is up to US left wing democratic socialists in the US to build their future but I think if I was there I may be with the Democratic Socialists of America to move it leftwards and to reach out plus perhaps they could bring all these oppressed groups together as a US Labor? Don’t forget Malcolm X Grassroots Movement, which just won the Mayor’s race in Jackson, MS. Many thanks for a very informative article, I was interested to hear about the reinvigoration of the DSA. Perhaps you can also enlighten us as to the state of the left in Canada. I’ve previously written about the ongoing leadership election in Canada’s labour party (called the New Democratic Party, or NDP). One of the candidates is positioning herself as the Canadian Corbyn, although unfortunately I doubt she’ll win. I may write more about the Canadian left once the leadership contest is over (sometime in October). What could have been a mass based working class movement was suppressed with violence unprecedented outside of the third world fascist/communist countries. As late as the middle of the last century coal mining companies used armed strike breakers and companies like Pinkertons. Also to be taken into account was the massive corruption of much of the trades union leadership exemplified by The Teamsters but widespread all over with grass roots activism suppressed by organised crime. Finally, in the face of this, most organised unions ended up supporting the Democrats where they still are. A study of The Wobblies and a reading of John Steinbeck are well worth in relation to this subject.